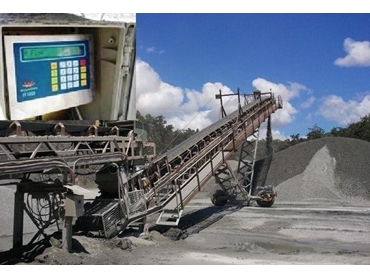 A belt weighing system at Hanson’s Nerang quarry on Queensland’s Gold Coast was recently fitted with a replacement digital weight integrator. Supplied and commissioned by Accuweigh’s QWM branch in Brisbane, the belt weighing system was fitted with an Accuweigh IT3000 digital weight controller running optional conveyor scale software. Based on a standard digital weight indicator with a stainless steel IP65 rated housing, the IT3000 is very operator friendly and ideal for use in all basic belt weighing systems. An added bonus of the IT3000 based belt weighing system is its ability to be configured for operation with or without an external pulse input (tacho) to generate belt speeds. To ensure good weighing accuracy could be attained by the IT3000 based belt weighing system, Hanson’s maintenance staff reconditioned the roller bearings fitted to the weigh frame. As this belt weighing system is not fitted with a belt speed sensor, it is not suited for trade use and in this application only used to track the volume of material that is being stockpiled each day for stock control purposes. Accuweigh’s QWM branch has extensive experience in servicing and repairing belt weighing systems for quarrying, mining and general purpose applications.